Two cities are trading in buses in favor of privately-owned and operated rideshare vans. What are they hoping to get out of it? 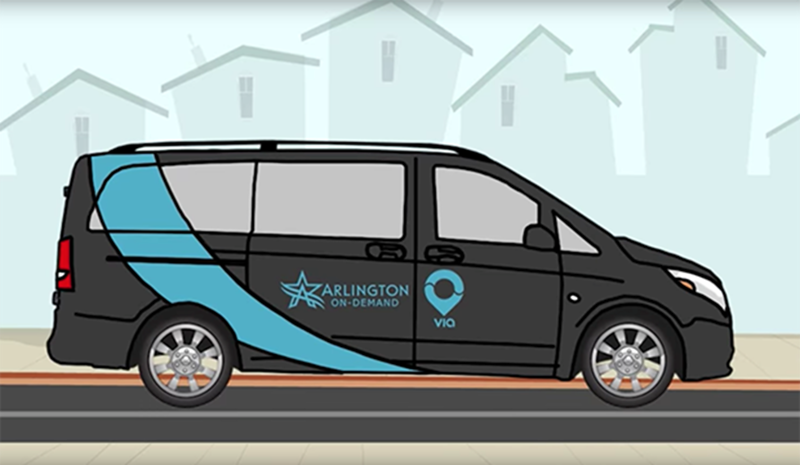 Arlington, TX and West Sacramento, CA have traded in their buses and are experimenting with replacing their public transportation with ride-sharing solutions. Both cities have entered into agreements with app-based ride-hailing company Via to roll out on-demand public transportation service along city streets. The Arlington pilot program officially launched December 11, 2017 and is supported by the citizen-led Transportation Advisory Committee. The initial contract period is for one year, with four one-year renewal options. The service replaces the Metro Arlington Xpress, or MAX, commuter bus service, and expands upon the MAX’s service area. The yearlong West Sacramento pilot program is expected to begin in the Spring of 2018, with company officials implementing the service through the Yolo County Transportation District. First launched in New York City in September 2013, Via currently operates in New York City, Chicago, and Washington, D.C., providing more than 1.5 million rides per month. Via also licenses its on-demand transit technology to transportation operators globally. Users book a shared ride through the VIA smartphone app. A Mercedes-Benz Metris Van will then transport riders anywhere within the service area for a flat-fare. While West Sacramento’s program has yet to officially launch, the Arlington fare is $3- competitive with current bus service pricing points. Proponents of the service point to rideshare as being a more efficient and responsive transportation alternative to buses. Whereas using a bus may require several transfers and a sometimes long walk to a transit stop, the Via service does not have fixed pickup locations. Riders could be picked up within a block or two of their present location and be dropped off within eye-sight of their desired destination. 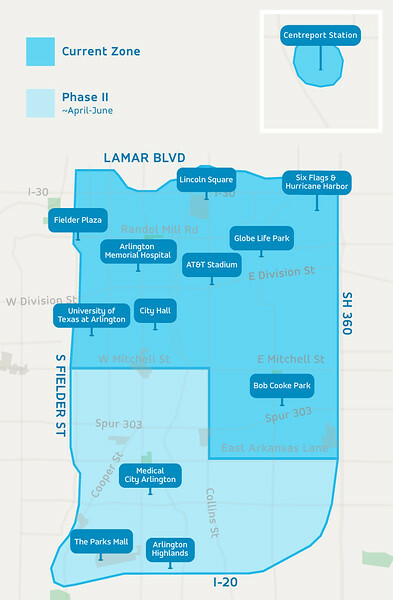 The Arlington service area will initially encompass Downtown and the City’s vibrant Cultural Arts District, the University of Texas at Arlington, the Entertainment District, and the area around Arlington Memorial Hospital. Customers can also connect to the TRE Centreport/DFW Airport Station, where they can then catch a commuter train to Dallas or Fort Worth. By next summer, the service area will include a large portion of the City between I-30 and I-20, which will allow customers to reach major retail destinations such as the Parks Mall and Arlington Highlands. Service areas may shift over time as information is gathered about demand for service. The West Sacramento service area is designed to support the Riverfront Districts. The City is designing the service to also feature free or reduced fares to and from transit stops, bikeshare stations and to major events in order to connect residents to a range of mobility options. The service and data gleaned from the pilot will be supported and evaluated by UC Berkeley’s Transportation Sustainability Research Center (TSRC). Both cities that have/are introducing this service have varying reasons for exploring ride-share services. West Sacramento added bike share in 2017, and is expanding the serice to include electric bikes this year. Here, Via is seen as part of a multi-faceted mobility network that promotes car-free living. In Arlington, residents have repeatedly voted against taxing measures to build a mass transit system. In fact, until the now scrapped Metro Arlington Xpress was launched in 2013, the city was the biggest American city without a public transportation system. As nearby Dallas continues to expand its light rail network, Arlington has turned to Via as a cheaper transportation alternative to light rail. A third of the total project cost, or $332,500, is being paid for by the City of Arlington with the remainder being paid via a grant from the Federal Transit Administration. In West Sacramento, the cost is being split by the City of West Sacramento and the Sacramento Area Council of Governments (SACOG).